Moscow City Court passed down the first sentence in the 2006 killing of Novaya Gazeta journalist Anna Politkovskaya. 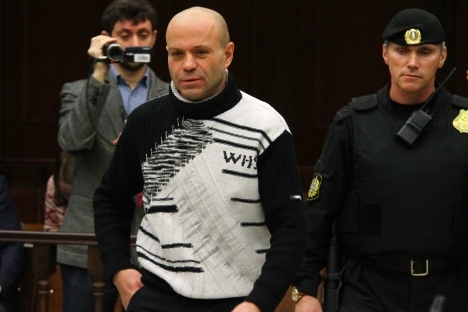 Retired police officer Dmitry Pavlyuchenkov was sentenced to 11 years in a high-security prison and a fine of 3 million rubles ($100,000) today for his role in the contract killing of Novaya Gazeta investigative reporter Anna Politkovskaya, the Russian Legal Information Agency reported from the Moscow City Court on Friday. Politkovskaya was shot dead on October 7, 2006 in an apartment block in central Moscow, where she lived. Former Lieutenant Colonel Pavlyuchenkov, 44, admitted organizing surveillance of Politkovskaya, famous for her critical reports on human rights abuse in Chechnya, and entered a plea bargain testifying against five other suspects. The prosecutor had requested 12 years in prison for Pavlyuchenkov, who reportedly received “no less than $150,000” for his role in the killing. The children of Anna Politkovskaya sought to claim 10 million rubles ($330,000) from Pavlyuchenkov in compensation for “moral damages.” The judge ruled the sum should be reduced to 3 million rubles ($100,000). “Justice has not been done fully, but it has been done,” Ilya Politkovsky, the son of Anna Politkovskaya, told Novaya Gazeta in the courtroom immediately after the verdict was announced. Both sides will appeal the verdict, they said. Karen Nersesyan, Pavlyuchenkov’s lawyer, was cited by Novaya Gazeta as saying that the prosecutor violated the plea bargain terms by requesting a too-long sentence. Pavlyuchenkov, who was apprehended and then placed under home arrest over health problems in August 2011, has nine years and eight months of his sentence still to go, due to time served. In his final statement Pavlyuchenkov begged forgiveness from Anna Politkovskaya’s family, Gazeta.ru reported. The other five suspects, including the alleged triggerman Rustam Makhmudov, are in custody and will be tried separately, RIA Novosti reported. The person who ordered the killing remains unknown to date.